Hi guys! TGIF. I have been looking forward to this week to finally come to an end, but not for the typical 'I hate my job' reasons. Okay, that has a little something to do with it too haha. But it's mostly because it's time for my big announcement and a brand new segment for Manicured and Marvelous... today marks the very first edition of Puppy Prints! No... not those kind of puppy prints haha. Though I have to admit that painting my little girls nails was almost too tempting. But no, Puppy Prints is a special segment where my little one helps me pick out a stamping plate and color scheme. This was initially brought up as a joke between my friend and I, but the more I thought about it I realized how much fun it sounded. Of course Sophia was totally down to play with my polishes without getting scolded for once haha. You can check out the first 'episode' now on my YouTube channel: http://www.youtube.com/c/RoselynnMercedes787. Hmm... I wonder what stamping plate she'll end up picking next week, any suggestions for what to lay out for her? Be sure to let me know what you think and also please subscribe to my YouTube channel for more puppy and nail polish shenanigans. I can't get over how freakin cute this is!! I love little miss Sophia!! How adorable!!! The mani turned out great! Thanks so much :) She's definitely a cute puppy. Such a cute idea. She has great taste! Haha doesn't she though! She takes after her mommy lol. So cute- and your mani is great! So cute and she has great taste, too! Thanks haha she's been taking notes from her mom. She is always by my side when I do nail art. Thanks so much! I'm glad you enjoyed it, I figured as a fellow puppy lover you would! Aww this is such a cute idea!! Thank you :) I'm really glad it worked as well as I hoped. I was nervous she wouldn't work with me. This is so cute! I love how she selects things. Thanks. Didn't she do such a great job?! I'm honestly always blown away by how smart she is. What a cute idea, i cant wait to see what she picks next! Thanks. I can't wait either, I hope she goes with something bright this time. That is such a cute idea! Love the mani. Adorable! I love the puppy prints! Beautiful design! I think the idea is adorable! My daughter loves when I let her pick out polish colors for me lol. Thanks! I loved doing this with her so much. I should of thought of it a long time ago since she's always glued to me when I'm working on nail art. So cute! I love doing nail stuff with my DD and have let her do my nails before, it was hilarious! I think she made good picks! That's really adorable! Pretty mani! Puppy! Such an adorable idea and the mani came out great! 1. 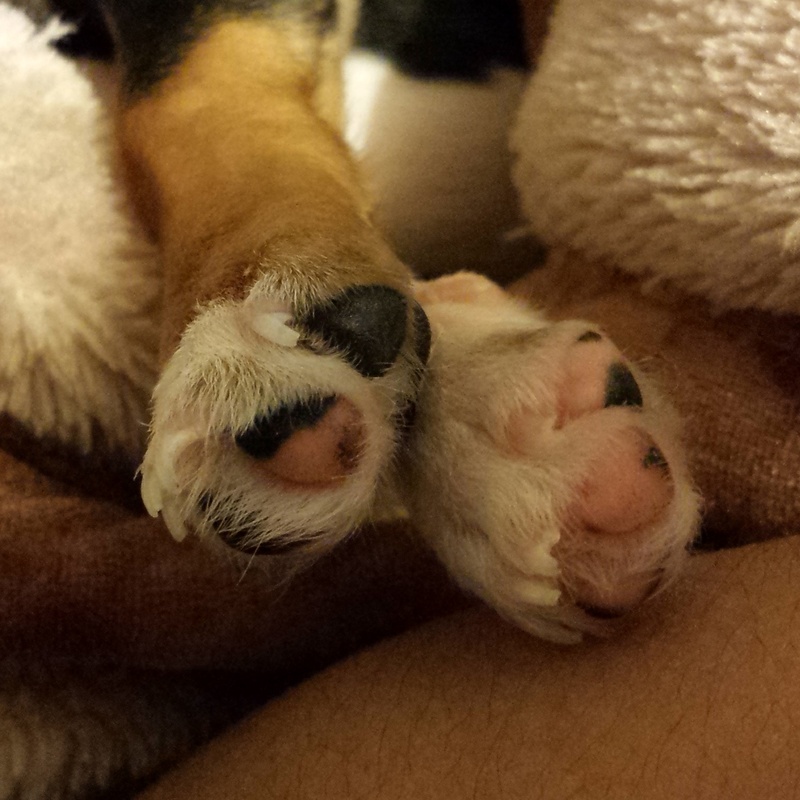 PUPPY FEET 2. I love this concept. So cute. Haha thanks! I love looking at her tiny paws. This pup has seriously become like a child to me lol. This is the cutest idea and I love how it turned out! i'm dying at how cute this is! my little female kitty always comes around when i'm putting on polish or makeup. i know she's into it!